jivi Mobiles – the Mobile Division of Magicon Impex Pvt Ltd, - has expanded its portfolio of feature phones with the launch of Sumo T3000 at Rs 1490 in Karnataka. The feature phone has a powerful battery of 3600 mAh that makes phone last up to 50 days (under standard operating conditions) in standby, even with 3600 mAh battery, phone looks slim and stylish. These innovations from jivi further the product philosophy of amalgamation of technology meeting millions of lives. jivi Mobiles is offering double assurance policy “111 days” replacement warranty & free screen (breakage) replacement on all its feature phone range. 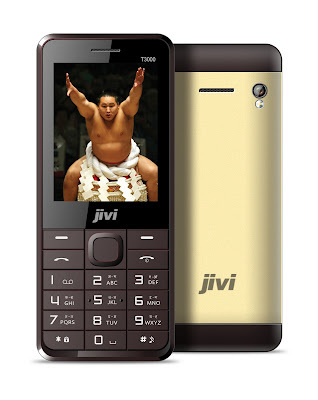 The company has also launched a scheme applicable with 5 jivi models namely Sumo T3000, N210, N3270, N4332 and N300. On purchase of any of the model, customer will get free T-shirt worth Rs. 300.
jivi Mobiles revolutionary double assurance policy “111 Days Replacement Policy” has been introduced where in case of functional failures, customer will get replacement, within first 111 days from date of activation/Purchase Bill. This policy is effective from April 15, 2017 i.e. on all handsets which are activated or purchased on or after April 15, 2017. “Screen Breakage Policy” has been introduced under which customer will be given free screen replacement on all jivi Models, for one time only within first 111 days from date of activation/Purchase Bill. This policy is effective from April 15, 2017 i.e. on all handsets which are activated or purchased on or after Apr 15, 2017. Every feature that is present in the feature phone has been made keeping in mind the requirements and understanding the mindset of the people. jivi mobile promises to offer mobility solutions that stand on three firm pillars of On the go Concept (OTG), durable and cost effective products. All jivi products meet Bureau of Indian Standards (BIS) specifications. The device would be ‘Made in India’, atour newly opened facility in Mahipalpur. The purpose of setting up these manufacturing facilities is to save on the imports duties and hence cut on the manufacturing cost by 10-15%. We would pass on the benefit to our customers,” said Pankaj Anand.